Charles A. Rogers is the author of a fully illustrated paper(a) in which he locates the city of Atlantis on the Tunisian River Triton, which led from Chott el Jerid (formerly Lake Tritonis?) to the Gulf of Gabes. He dates the demise of Atlantis to 1404 BC based on a possible connection with a close encounter with Phäeton, which in turn he identifies as what was later to be known as Halley’s Comet. He also combines all this with the eruption of Thera that generated a tsunami, which ran across the Mediterranean to the Gulf of Gabes and destroyed the city of Atlantis and in Egypt wiped out the Pharoah and his men during the biblical Exodus. There seems to be too many coincidences required here. With regard to the location of Atlantis, the satellite imagery used by Rogers is, in my view, not very convincing and although I am sympathetic to the existence of Atlantis in that region, I think only investigation on the ground will offer real evidence. Melville Nicholls is a senior research scientist at the University of Colorado where he studies atmospheric science, mainly relating to hurricanes. In May 2013 he published Children of the Sea God as a Kindle ebook. One of his main contentions is that Atlantis existed during the early Bronze Age at the time of the Bell Beaker culture. He also contends that Britain was the large island of Atlantis described by Plato. However he also proposes that the main port city of Atlantis, with the concentric rings of land and water was situated in southwest Spain near Gibraltar. He proposes that this port was destroyed by an event such as a tsunami. While all these features have been proposed individually as characteristics of Atlantis, Nicholls brings them together in a comprehensive theory, but not without indulging in a liberal amount of speculation. He devotes a considerable amount of space attempting to link Stonehenge with the Atlanteans. While I was not won over by Nicholl’s book, it is worth a read and might best be studied along with Donald Ingram’s book, The Unlost Island. The idea of ‘two’ Atlantises was probably first promoted by Lewis Spence and more recently by Karl Jürgen Hepke. In fact, were there not ten Atlantises? However, they were shipwrecked on Malta or as some claim on Mljet in the Adriatic. The earliest modern reference to these gulfs that I can find in connection with Atlantis was by Nicolas Fréret in the 18th century when he proposed that Atlantis may have been situated in Syrtis Major. Giorgio Grongnet de Vasse expressed a similar view around the same time. Since then there has been little support for the idea until recent times when Winfried Huf designated Syrtis Major as one of his five divisions of the Atlantean Empire. However, the region around the Gulf of Gabes has been more persistently associated with aspects of the Atlantis story. Inland from Gabes are the chotts, which were at one time connected to the Mediterranean and considered to have been part of the legendary Lake Tritonis, sometimes suggested as the actual location of Atlantis. In the Gulf itself, Apollonius of Rhodes placed the Pillars of Herakles(a) , while Anton Mifsud has drawn attention to the writings of the Greek author, Palefatus of Paros, who stated (c. 32) that the Columns of Heracles were located close to the island of Kerkennah at the western end of Syrtis Minor. Lucanus, the Latin poet, located the Strait of Heracles in Syrtis Minor. Mifsud has pointed out that this reference has been omitted from modern translations of Lucanus’ work! Férréol Butavand was one of the first modern commentators to locate Atlantis in the Gulf of Gabés. In 1929 Dr. Paul Borchardt, the German geographer, claimed to have located Atlantis between the chotts and the Gulf, while more recently Alberto Arecchi placed Atlantis in the Gulf when sea levels were lower(b) . George Sarantitis places the ‘Pillars’ near Gabes and Atlantis itself inland, further west in Mauritania, south of the Atlas Mountains. Antonio Usai also places the ‘Pillars’ in the Gulf of Gabes. In 2018, Charles A. Rogers published a paper(c) on the academia.edu website in which he identified Tunisia as Atlantis with it capital located at the mouth of the Triton River on the Gulf of Gabes. He favours Plato’s 9.000 ‘years’ to have been lunar cycles, bringing the destruction of Atlantis into the middle of the second millennium BC and coinciding with the eruption of Thera which created a tsunami that ran across the Mediterranean destroying the city with the run-up and its subsequent backwash. This partly agrees with my conclusions in Joining the Dots! William Bruce Masse (1948- ) is an environmental archaeologist with the Los Alamos National Laboratory. He turned to mythology as means of unravelling some of the world’s historical mysteries. In particular, Masse studied 175 flood myths among which two gave clues to a major event that occurred in 2807 BC, which Masse linked to a cometary impact south of Madagascar creating the Burckle Crater and producing a 600 foot tsunami that swept around the world(a) . Masse implied a connection with the destruction of Atlantis when he co-authored a paper that was presented to the 2005 Atlantis Conference on the Burckle Crater. 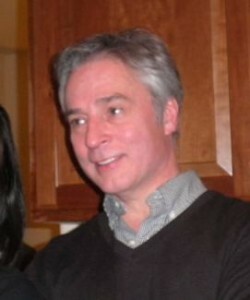 Masse is a leading member of the Holocene Impact Working Group. Dr. Richard Freund is the latest academic to enter the Atlantis debate. Freund is a rabbi and the director of the Greenberg Centre for Judaic Studies at the University of Hartford. He is the author of Digging Through the Bible in which he recounts his experiences excavating in the Middle East. Freund ‘led’ (see below) an expedition of Spanish, American and Canadian scientists in 2009 and 2010 to investigate satellite the images of the Doñana Marshes, showing circular and rectangular features, discovered by Werner Wickboldt in 2003. National Geographic have included the findings of the expedition in a 2011 documentary entitled Finding Atlantis(a). Another documentary, along with a transcript, which also ‘stars’ Freund, entitled “Atlantis – The Lost City” is available(e). Freund has also inveigled his way in to the 2017 National Geographic documentary, Atlantis Rising. Freund believes that these structures discovered at Doñana are related to Atlantis/Tarshish. Freund has pointed out that the large amounts of methane emanating from the site suggests that only a tsunami could have suddenly trapped the large quantities of organic matter required to generate that quantity of methane! However, a more sober view is presented by by Juan Villarias-Robles a Spanish anthropologist working with the Spanish team investigating the Doñana site. He recounts(b) how Professor Freund spent less than a week on the site and was not the leader of the Hinojos Project. With regard to the features identified by Wickboldt, Villarias-Robles explains that so far anything found has been smaller than anticipated or dated to the Muslim period. He declares that no remains of Tartessos or Atlantis have been found. Equally moderate are the comments of archaeologist Philip Reeder from the University of South Florida, who is also unconvinced that Atlantis has been found(c). Furthermore, the respected Greek historian Ephorus described Tartessos in his day (4th century BC) as still being a rich source of tin, copper and gold(d). Since he wrote this long after Solon’s visit to Egypt, and even longer since the sinking of Atlantis, it would appear to rule out identifying Atlantis with Tartessos. 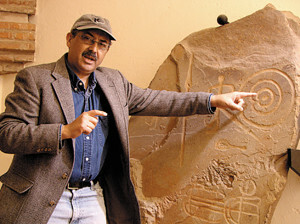 Freund also believes that the Phoenicians were descendants of the Atlanteans. No doubt these contentious claims will be explored in greater detail in his book Digging Through History: From Atlantis to the Holocaust. 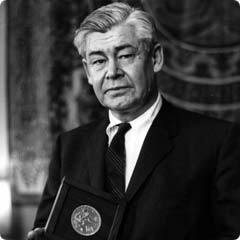 W. Sheppard Baird is an American researcher and the author of a number of articles on the Minoan civilisation, which can be read on his website(a) and on the academia.edu website(f). He writes on the maritime expertise of the Minoans and their colonisation of Spain. Baird has also incorporated his knowledge of the Minoans into an historical novel, The Minoan Psychopath. Baird added an interesting paper(b) on the possible use by the Minoans of a signalling system using bronze mirrors reflecting sunlight between the mountain peaks of Crete! Perhaps even more important is his essay(c) debunking of the theory that a tsunami resulting from the 2nd millennium BC eruption of Thera destroyed the Minoan civilisation on Crete and proposes instead that it was in fact more likely to have been a pyroclastic surge from the same source. The latest studies have concluded(d) that it was the violent entry of pyroclastic flows into the sea which triggered the tsunamis. Baird has also offered his identification of the Sea Peoples, whom he considers to originally have been colonists from the Aegean who settled in the southeast of Spain and are known as the El Argar culture. Their society suffered some form of collapse around 1350 BC and according to Baird is in some way connected with the emergence of the Sea Peoples. Unfortunately, in spite of the name of his website, Baird makes no direct reference to Atlantis. 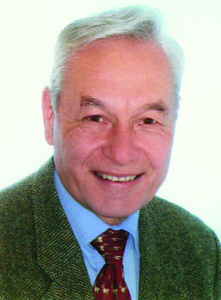 Walter Schilling (1938- ) is a retired German political scientist. In his book, Atlantis – Die letzten Geheimnisse einer versunkenen Welt(Atlantis – The last secrets of a lost world) he describes Atlantis as an island metropolis established around 4000 BC in the Bay of Cadiz in South West Spain and part of the megalithic culture of Western Europe. He further claims that it was destroyed by a natural disaster, possibly a tsunami following a cometary impact, circa 2700 BC. Volcanism is not part of the Atlantis story as related by Plato. His narrative clearly attributes the destruction of Atlantis and the Athenians to flooding and earthquake. Admittedly, flooding can be the result of some volcanic activity, but in the absence of any evidence to support this view in the case of Atlantis, the idea is only supposition. While most accept that Atlantis was named after its first king, Atlas, Frank Joseph’s fertile imagination suggests that ‘the island of Atlantis was named after its chief mountain, a dormant volcano’. For those that place Atlantis in the Atlantic the idea of volcanic or seismic activity as the cause of the flooding of Atlantis AND Athens are hard pressed to suggest a location for this activity that would explain two catastrophes two thousand miles or more apart. However, the red, white and black stone that Plato may be related to volcanic eruptions that produce rock of tufa (red), pumice (white) and lava (black). Pumice has been found at various locations in Egypt and identified as originating not only from Thera, but also from eruptions on the Greek islands of Nisyros and Giali as well as the Italian Lipari Islands(o). 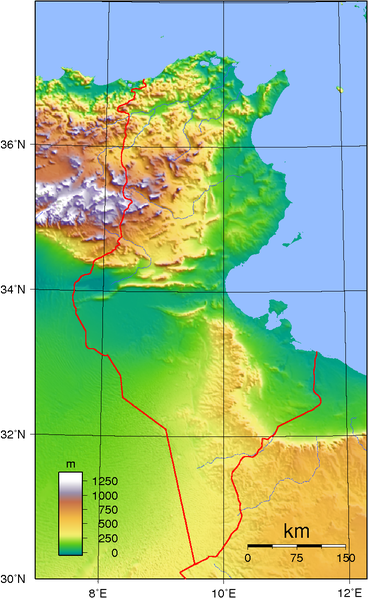 Jelle Zeilinga de Boer and Donald Sanders are the authors of Volcanoes in Human History in which they support the idea that the eruption on Thera was a factor in the development of the Atlantis story and also suggest a link with the Flood of Deucalion. Nevertheless, a recent book by William Lauritzen, The Invention of God, makes a convincing case for accepting volcanic activity as the inspiration behind some of the imagery of ancient mythologies and most major religions. A recent article(i) on the BBC website expanded on this further. Lauritzen also suggests that the pyramids were meant to represent volcanoes. The most active volcanic region of Europe is to be found in Italy, where Etna and Stromboli have been continuously erupting for thousands of years(b). There is a report that a 6000 BC extreme eruption of Etna resulted in a tsunami 130 feet in height which swept the Mediterranean(c). However, the most devastating prehistoric volcanic eruption discovered so far seems to have been in Siberia 252 million years, which may have led to the most extensive mass extinction of life on earth(e). This is now rivalled by Tamu Massif in the Pacific mentioned below. The cataclysmic volcanic eruption of Thera in the second millennium BC has had a strong level of support as the cause of Atlantis’ collapse, a view endorsed by recent television documentaries and an IMAX film. The Greek volcanologist, George Vougioukalakis, whose research is featured in the aforementioned film, is convinced that the eruption of Santorini offers the most rational explanation for the truth behind Plato’s story(a). However, he dissents from the recently expressed view that pumice found on the Northern Sinai Peninsula was transported there by a tsunami generated by the eruption of Thera and prefers to believe their transportation there was by normal sea currents. 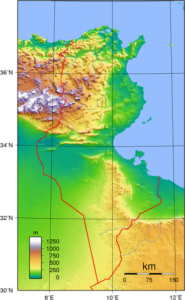 Apart from Santorini, Jim Allen had initially proposed the Andean village of Quillacas, which lies on top of a volcano, as the site of Atlantis, but later found that the nearby site of Pampa Aullagas had a greater correspondence with the description of Atlantis. More recently Richard W. Welch has suggested the eruption of a supervolcano in the Atlantic as the cause of Atlantis’ demise. And so the idea of a volcanic destruction of Atlantis still has some support! 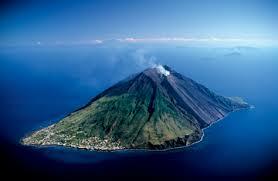 Since January 2011, Santorini has shown some signs of a volcanic reawakening(d). In September 2013 studies revealed(f) what may be the location of the largest volcano ever to have erupted on our planet. It would have been the size of the British Isles and situated underwater in the northwest Pacific and known as Tamu Massif. It would have rivalled the Olympus Mons on Mars, but fortunately has been dormant for 140 million years. In December 2014 a report from Princeton University revealed that a massive series of volcanic eruptions 66 million years ago can be aligned with the extinction of the dinosaurs and should be included as part of the cause of that extinction along with the Yucatan meteorite impact(h). The Laki volcano in Iceland erupted in 1783 killing 9,000 local people but more dramatically causing the Nile Valley population to be cut by a sixth, according to a study published by scientists at Rutgers, The State University of New Jersey. “The study is the first to conclusively establish the linkage between high-latitude eruptions and the water supply in North Africa”(j). A 2015 report(k) suggests that a series of North American volcanic eruptions in 536 AD had such a detrimental effect on the climate of Europe that contributed to the demise of the Roman Empire. Furthermore, there is now evidence(m) that the eruption of El Chicon volcano in Southern Mexico around 540 AD led to the disruption of the Maya civilisation. Can there be a connection between these two events? However, David Keys in his book, Catastrophe, has proposed that a massive eruption of Krakatoa around 535 AD caused disruption on a global scale. Matthew Toohey from the GEOMAR Helmholtz Centre for Ocean Research in Kiel, Germany, has suggested the possibility of a double event involving both El Chicon and Krakatoa! Recently the longest (1,200 miles) continental volcano chain was identified in Australia(l). Storegga submarine slides are enormous underwater movements of glacial sedimentary deposits that were only recently identified. While many of these occurred following the melting of the glaciers at the end of the last Ice Age some more recent movements have also been identified. Either earthquakes or the decomposition of gas hydrates are their most likely cause. As many as three storegga have been identified that occurred off the west coast of Norway around 6000-5000 BC(a). The combined volume of material involved in the last two events has been calculated at 1700 cubic kilometres. As a consequence, gigantic tsunami were generated which flooded a number of landmasses including Scotland. Ulf Erlingsson suggests that one of these events, around 6100 BC, may have been responsible for the final submergence of the Dogger Bank in the North Sea, creating the impassable muddy shoals mentioned by Plato. The dating of these events is discussed by Bernhard Weninger and his associates in a 2008 paper available online(b). The evidence to-date suggests that the flooding of the Black Sea coincided with a storegga event, which would require a catastrophe on a scale not previously considered. In a 2017 paper(e), John M. Jensen offers additional evidence to support this contention. 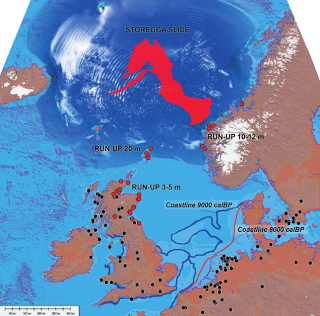 In 2014, Dr. Jon Hill revealed(d) the results of a study of the impact of the 6,200 BC Storegga on the low-lying Doggerland stating that “We were the first ever group to model the Storegga tsunami with Doggerland in place. Previous studies have used the modern bathymetry (ocean depth).” The study was commented on further by Axel Bojanowski in Der Spiegel with an English translation on the de Grazia website(f). The scale of the landslide is graphically described there. In 2015 the UK’s Daily Mail offered further details(c) gleaned from articles in the respected journal Geology and Science Nordic.